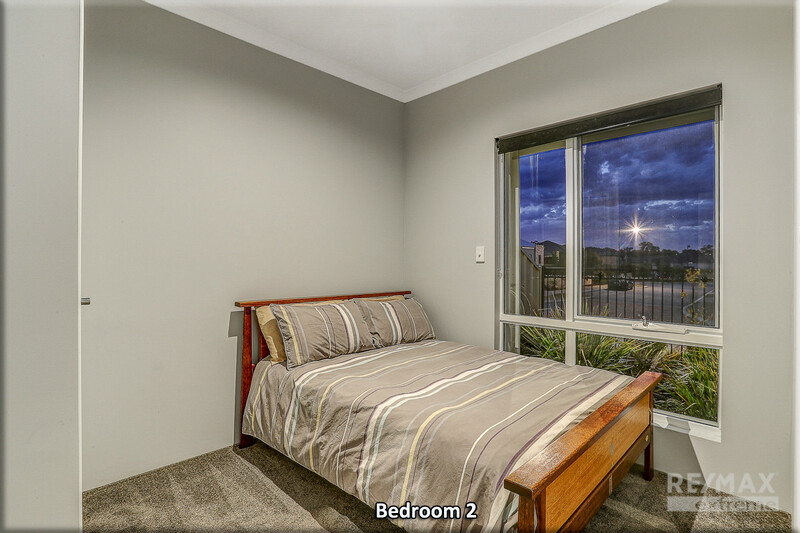 This top of the range 3×2 is loaded with quality upgrades and is perfect for first home buyers, young professionals or retirees alike! 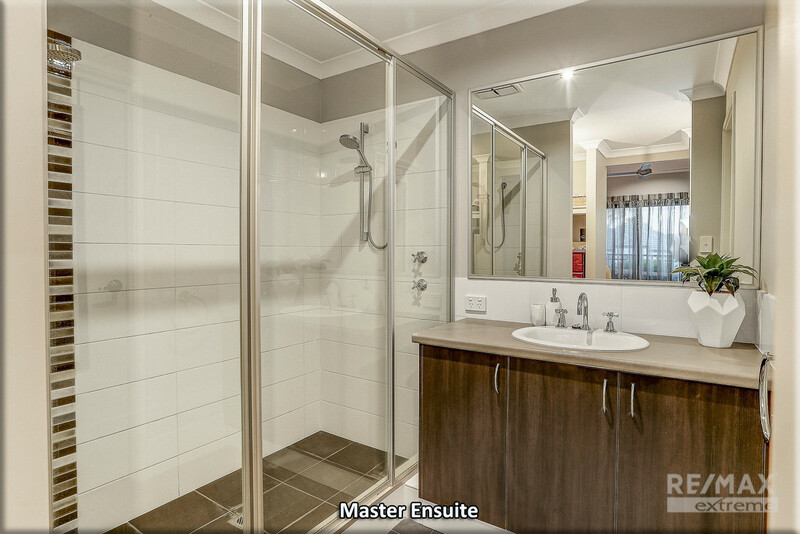 Conveniently positioned within a short walk of Butler trainstation, local schools & Butler shopping precinct, this super stylish home is ready to move into today and boasts an outdoor area to be proud of! 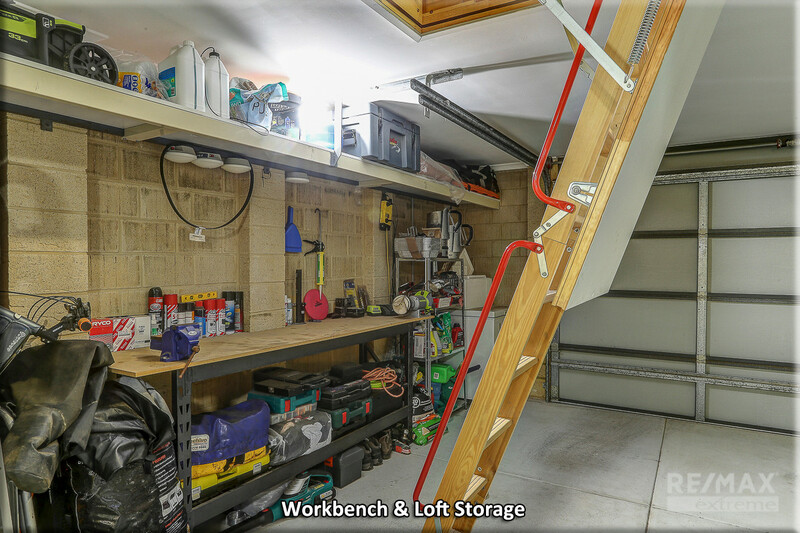 With a multitude of additional upgrades which you rarely see in properties of its type; we feel that this one really is the best of the bunch! 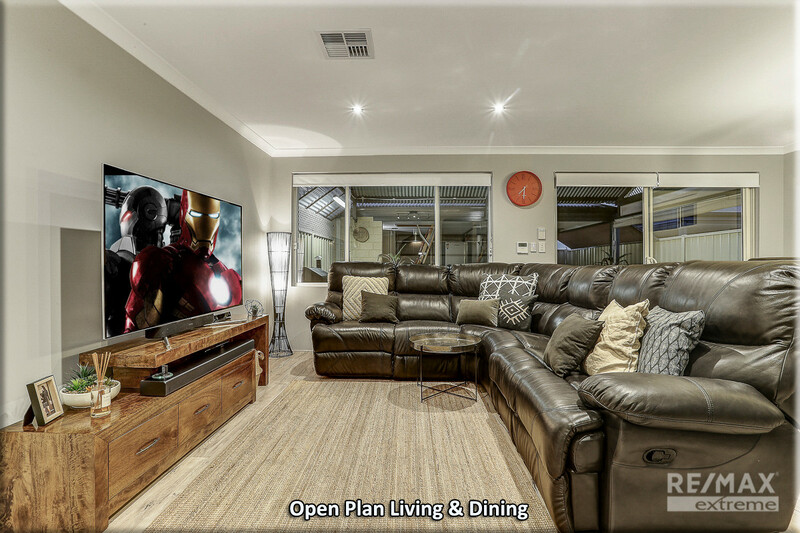 CALL TODAY and secure your private viewing! 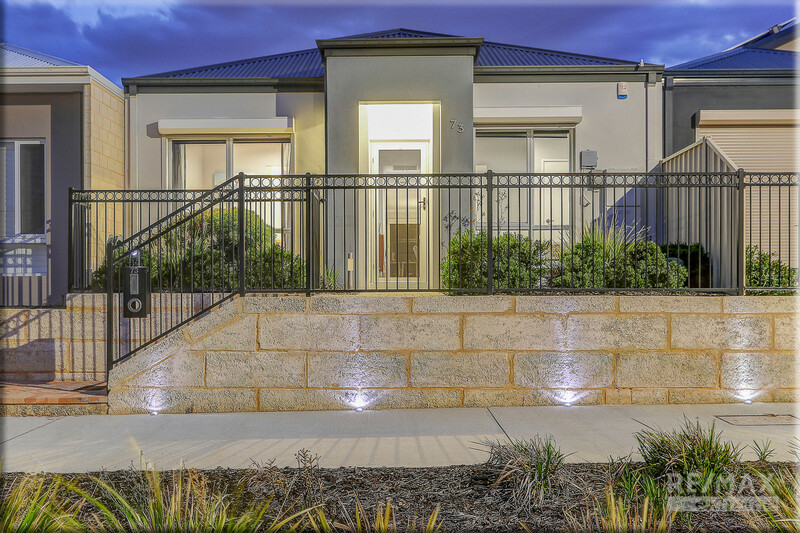 • This stunning 3×2 terrace home stands proud in the award winning ‘Green’ Estate and is instantly appealing to the eye! 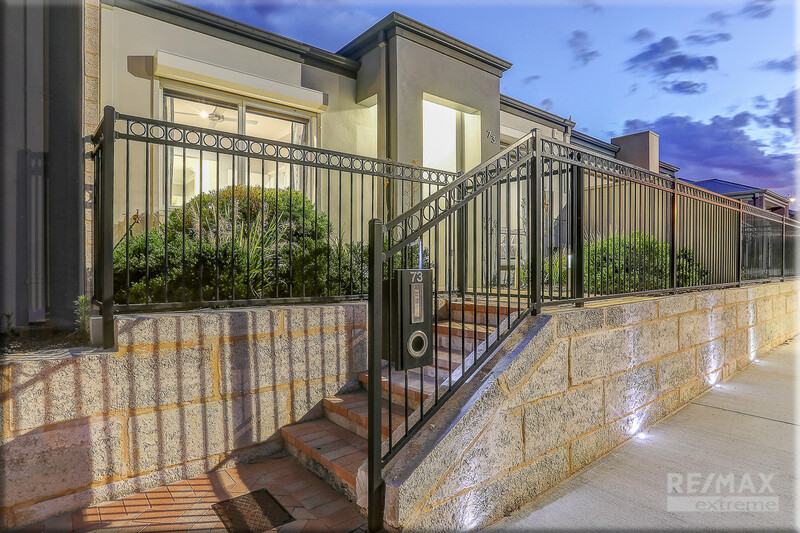 Proudly perched in a secure elevated position it features a modern rendered façade overlooking low-maintenance native gardens. 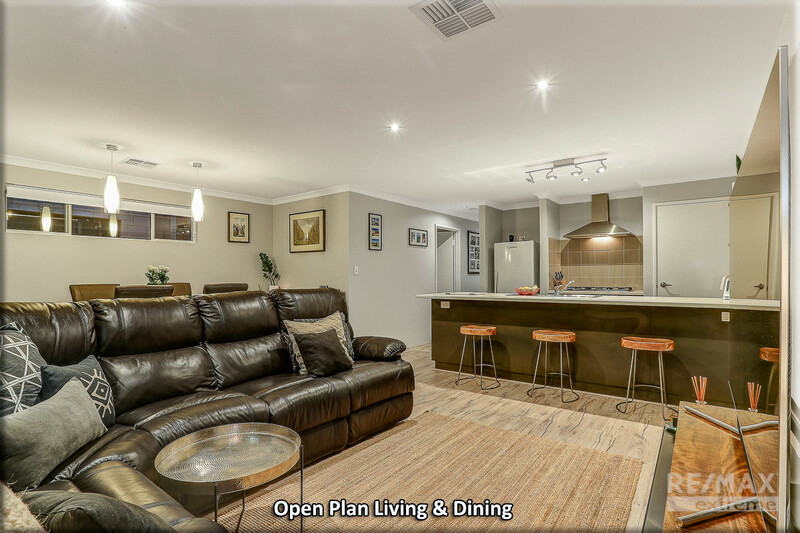 If it’s upgrades you want, it’s upgrades you’ll get here… with additional extras such as ducted reverse-cycle air conditioning, alarm system, security roller shutters + security doors, smart-wiring throughout, feature lighting, ceiling fans, security cameras and an extended double carport with workshop area + loft storage! 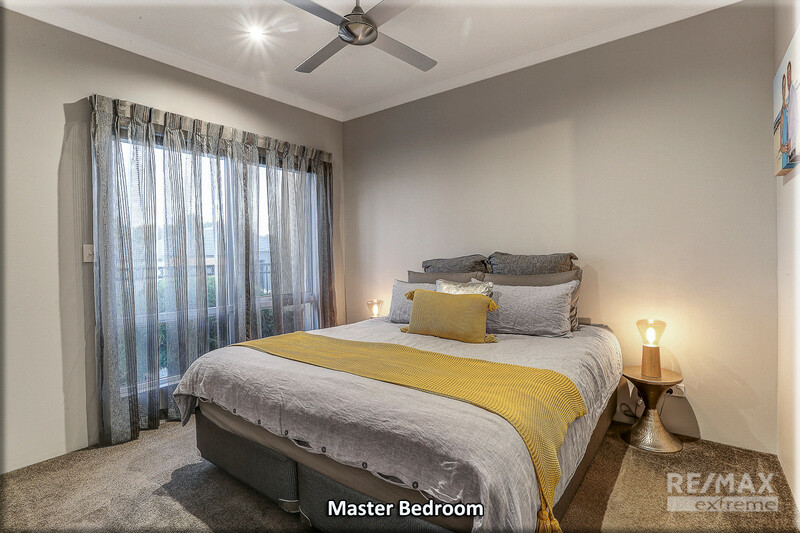 • The master bedroom boasts lofty 31c ceilings and features ‘his & hers’ walk-in robes, sumptuous carpets and window quality treatments. 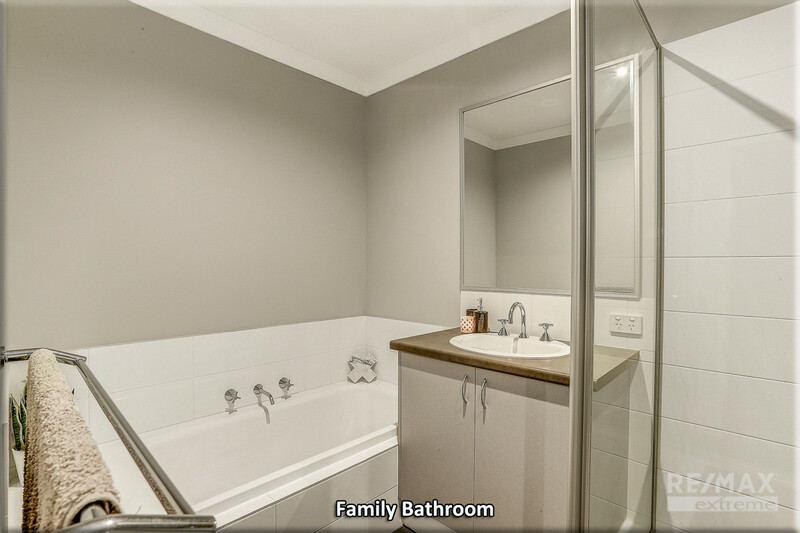 The open ensuite is light & bright with a clean finish and modern fixtures and fittings. 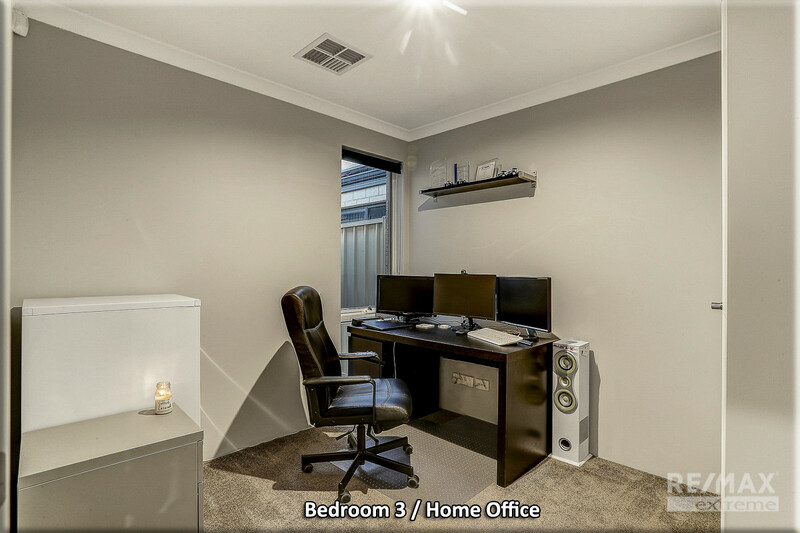 Bedroom 2 also features high ceilings, roller blinds, LED downlighting + dimmers, whilst bedroom 3 is central to the home and is ideal for a nursery or home office. 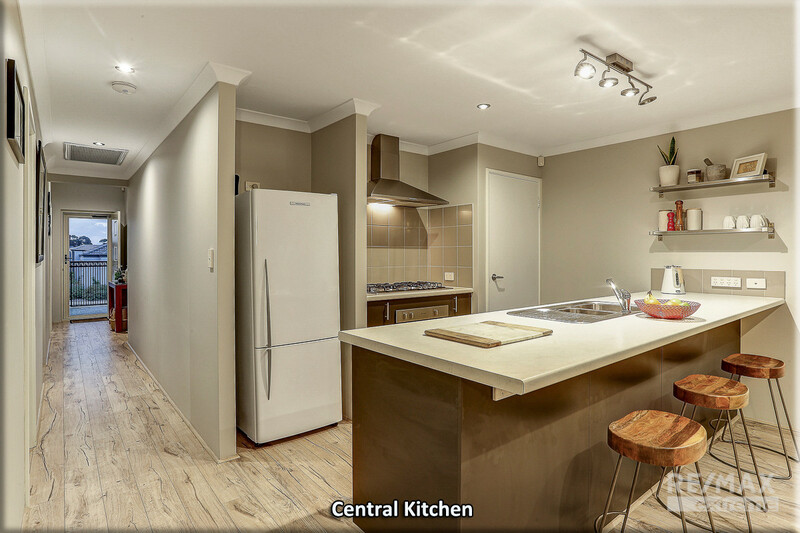 • If you like to get creative in the kitchen you won’t be disappointed! 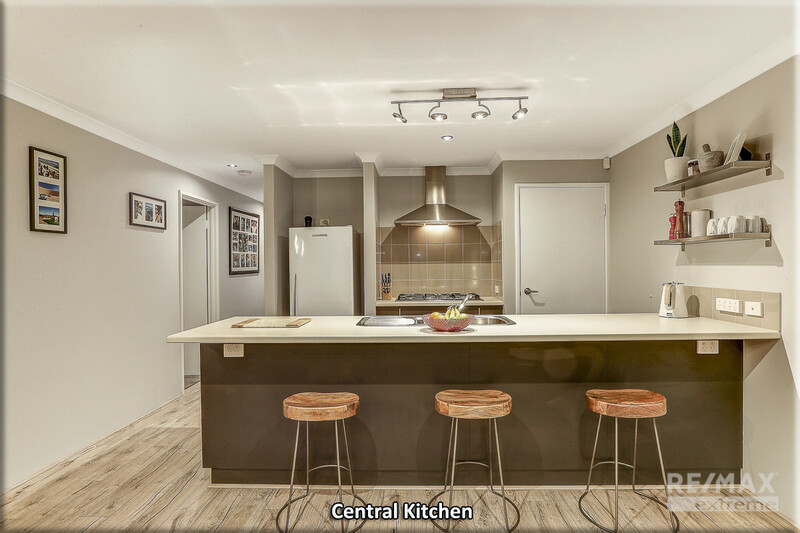 Centrally positioned, the well-appointed kitchen comes complete with stainless steel appliances + rangehood, dishwasher, extended breakfast bar, built in pantry, floating shelves, spot lighting and plenty of additional power points! 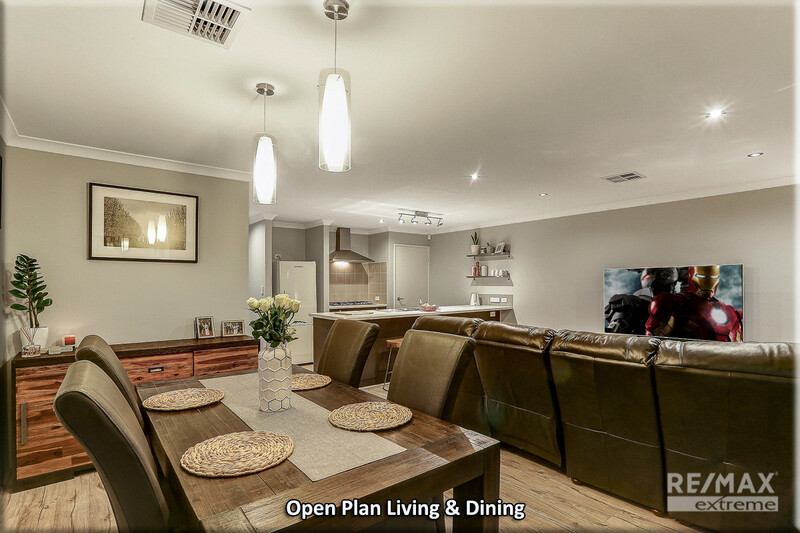 • When it comes to meals and quality family time, the open plan living & dining area offers a warm and cosy place to relax and unwind. 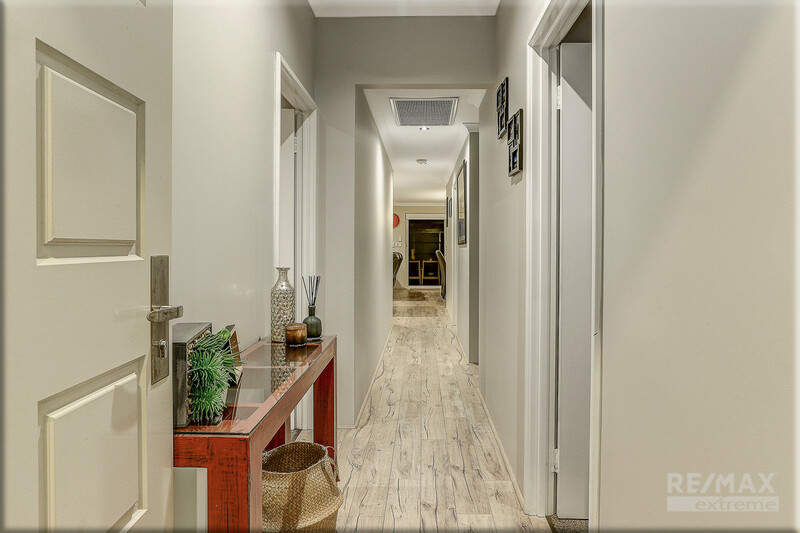 Fresh neutral tones, ambient lighting and stylish laminate flooring really set the scene! 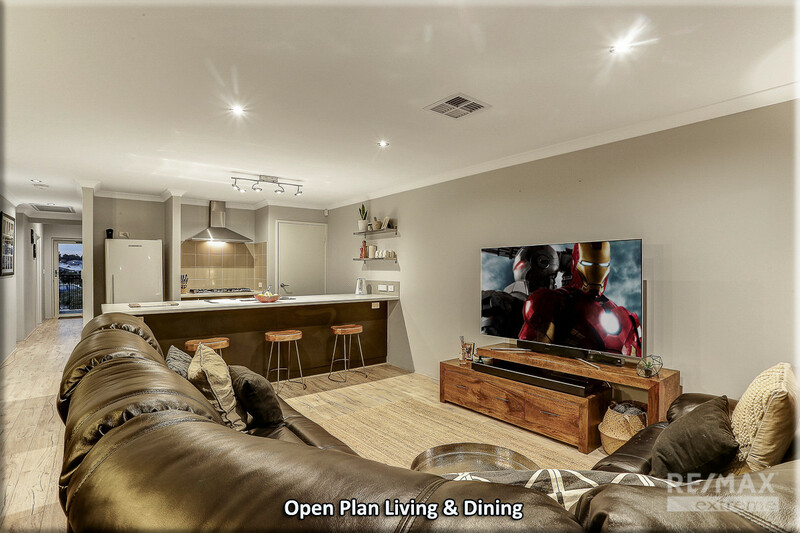 With immediate access to the outdoor entertainment area you the perfect place to entertain family & friends! 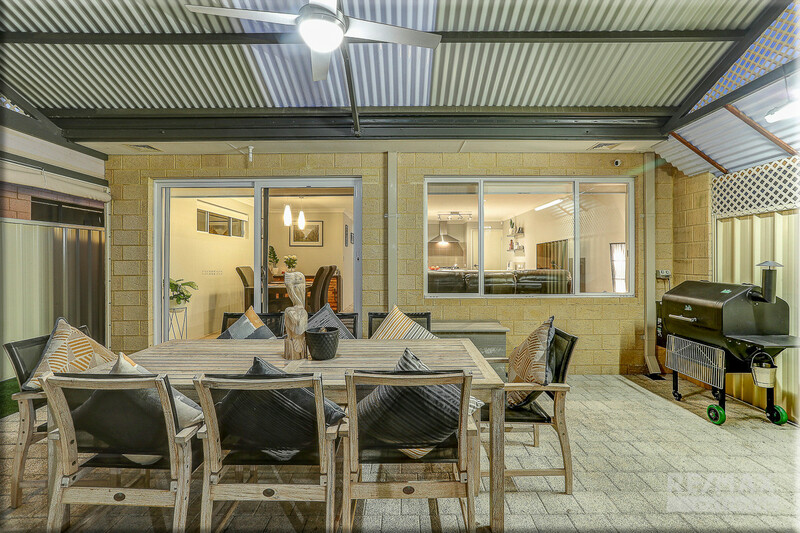 • One of the main selling points to this superb home has to be the entertainer’s courtyard which like the rest of the home offers plenty of upgrades! 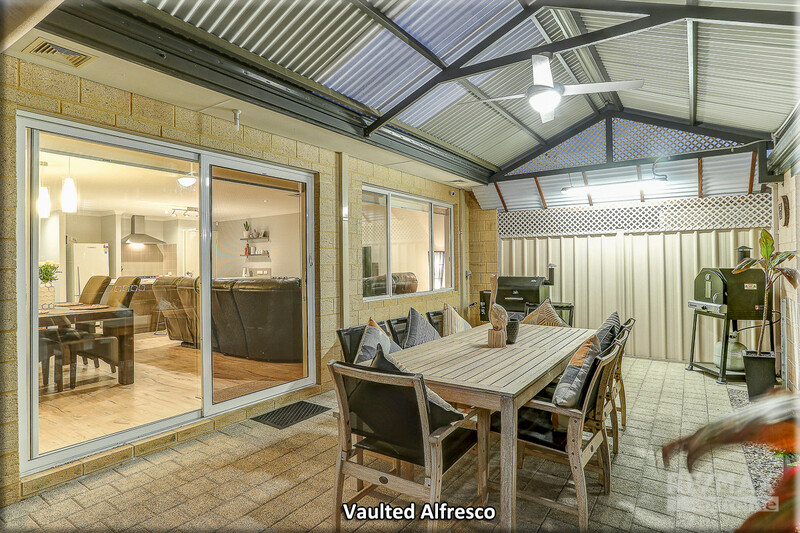 Private and secure; the huge vaulted patio is seriously impressive in stature and thanks to the weatherproof café blinds and overhead ceiling fan you can comfortably “dine out” all year round! 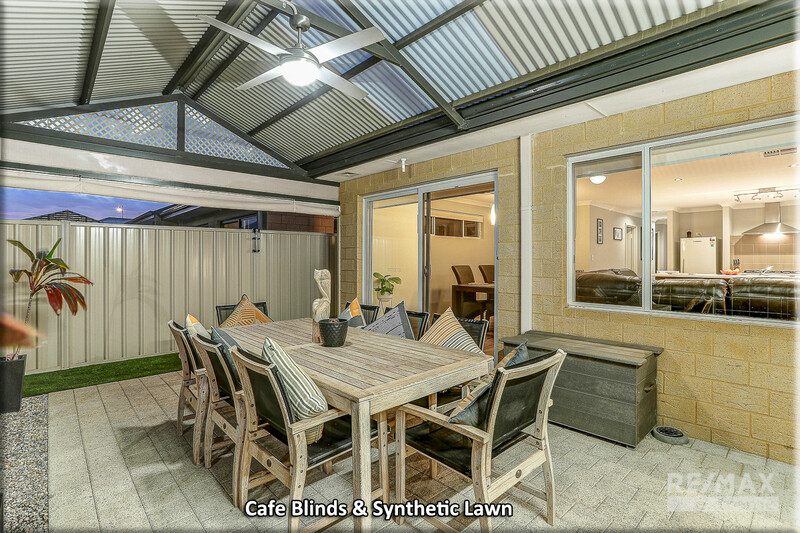 With synthetic lawns and pebbled surrounds there is literally nothing for you to do apart from sit back and enjoy your new surroundings in peace! 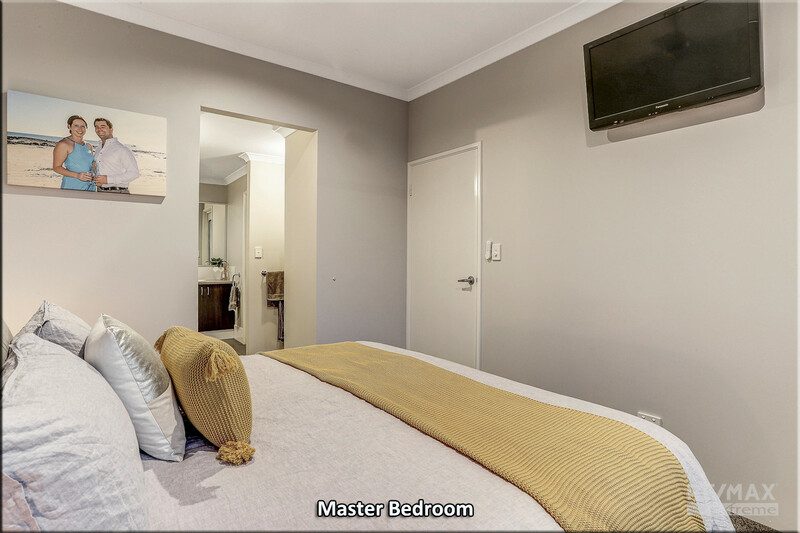 • EXTRAS INCLUDE: Extended double carport, laundry + linen, ducted reverse cycle air-con, smart wiring, security doors, fibre optic internet, TV bracket, additional powerpoints, flyscreens, reticulation and so much more.